The tremendous Sichuan earthquake has hit both humans and animals in the region hard. Chinese comic artist Coco Wang has taken some of the sad and amazing stories from Sichuan and made English-language comics of them. A story that Coco Wang has not (yet) made into a comic is the story of the hero pig who survived 36 days underneath rubble, eating only charcoal and drinking rain water. When the earthquake hit on the 12th of May, in the village Lunmengshang [ru. 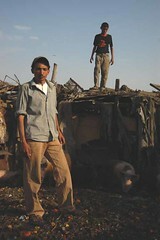 Лунмэньшань] near the city Pengzhou, a certain pigsty also collapsed. As soldiers came to clean up the rubble on June 17th, they discovered that one pig was still alive. The story of the pig was spread all over the country in the media, and the brave pig became a symbol of will. "Millions of people" prayed that the "hero pig" would escape the butcher for the rest of its life. 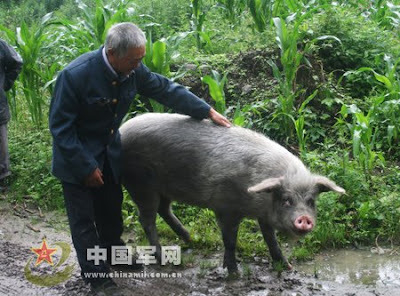 Fan Jianchuan, curator of the Jianchuan Museum nearby, finally bought the pig and assures that it will get to live in peace and die of old age. The museum has named the pig "Zhu Jianqiang", "Strong Pig". The farmer couple recall: "The moment the pig was rescued from the ruins, we used a board to protect his eyes from the glaring sunshine. And we saw the animal shed tears when we fed him later. We are too poor to feed him, so we had to sell him."